Investing in a good concrete countertop sealer is necessary for reducing renovation and repair expenses in the long run. Don’t wait until the last minute to give your countertops the care that it needs, because they cost a lot of money. Countertops found inside and outside your home can be guarded from the damage caused by exposure to the elements, wear and tear from frequent use, staining, and yellowing. At the same time, you don’t have to sacrifice the aesthetic appeal if you use a high-quality sealant. This is why it’s necessary to be analytical when selecting a concrete countertop sealer. There may be hundreds in the market that promise to do the same thing, although in reality not all of them provide the same value. Aside from looking for a product that has been produced by a reliable manufacturer, homeowners should look for non-toxic and food-safe sealers because the last thing you want on your countertops are toxic substances that can get into the food that you and your family eat. The Ghostshield Countertop Sealer 770 is the number one product in the market for affordable and reliable concrete countertop protection. Not only does its porous formula protect your concrete from the inside out, it also creates an additional barrier that guards from stains, yellowing, water absorption, cuts, and discoloration. After using this product, your counters will be as good as new with the additional benefits of protection while keeping it looking pristine. And it’s also safe for hot pans! Not all sealers in the market can brag about that. Although it was originally intended for use on counters, the versatile formulation of this product allows homeowners to use it on other places such as fire places, integral sinks, planters, and fire pits. This means that your money goes a long way! This water-based sealer uses an oleophobic and hydrophobic additive that goes deep into your concrete to repel water, fluids, and stains. It is completely free from VOC and is food-safe, so you don’t have to worry about nasty chemical compounds getting into your food after applying this sealer. The sixteen-ounce bottle can yield half a gallon of diluted formula. One pint can effectively cover as much as 30 square feet of concrete surfaces using two coat, making it look shiny, clean, and brand-new. Once you’ve applied it onto your concrete counters, it penetrates deep beyond the surface to create a strong, non-porous coating. It has been designed to go through the most moisture-absorbent areas of your counter and sinks. The Ghostshield Countertop Sealer 770 is also easy to use. Behind the bottle, you’ll find a detailed manual with clear instructions on how to use this concrete countertop sealer. Homeowners with especially large homes appreciate the fact that the Ghostshield Countertop Sealer 770 can cover so much concrete surface area. It comes in a 16-ounce bottle, which once diluted, can cover 30 square feet of countertops and other surfaces. That is an impressive feat on its own, but more importantly it is extremely effective and works well. 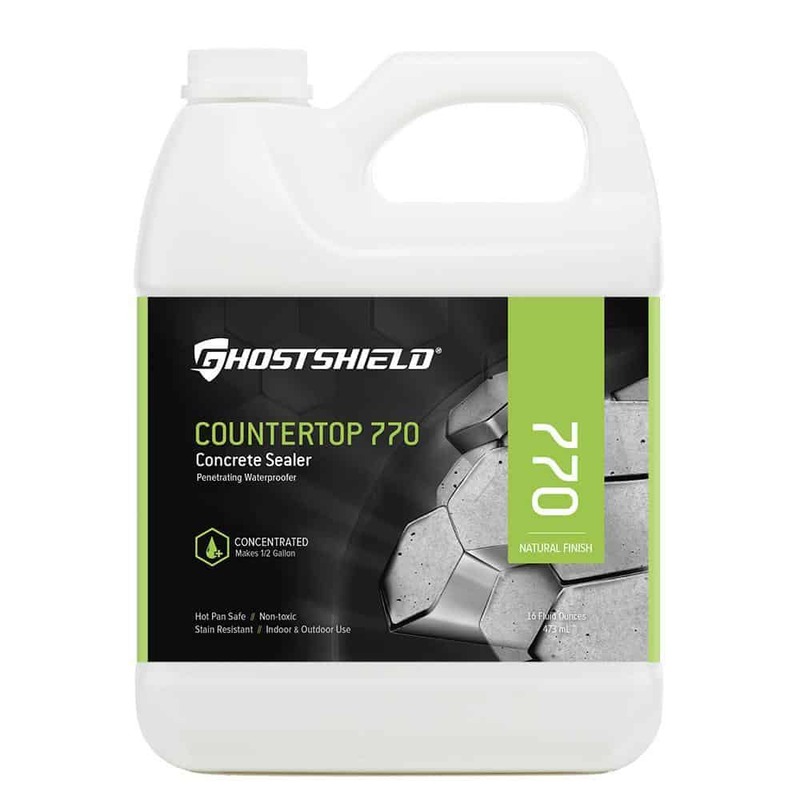 The Ghostshield Countertop Sealer 770 uses a formula that allows it to quickly and efficiently go deep into the various layers of your concrete countertops. It will fill the holes that may have formed so that water, fluids, and moisture never get into them. And this isn’t what the brand is just claiming. The product has actually undergone tests which reveal that it has met or exceeded industry standards in water penetration. Ghostshield knows the importance of using cleaning products that are non-toxic and food-safe. Unlike other companies that still use harmful chemicals in their formulation, homeowners can have peace of mind knowing that no toxic compounds make it into the food you eat. It also has low levels of volatile organic compounds, which when inhaled, can be hazardous. The Ghostshield Countertop Sealer 770 is not only a world-class sealer, but it also cares for your health. Each bottle of Ghostshield Countertop Sealer 770 comes with easy to understand and detailed instructions. It recommends using a 3/8” nap roller or brush and apply two coats after diluting it. The first coat will dry after 5-10 minutes; after which you can apply a second coat. Any puddles can be rolled or broomed out. If you are applying it to an external concrete surface and it starts to rain, just stop the application and make sure to cover the areas that already have product. The typical drying time is 4-6 hours if you live in an area that has 50% relative humidity and temperatures of 70F. However, if you live in an area that has higher relative humidity and cooler temperatures, this may prolong the drying time. Surfaces that have been treated for vehicle and pedestrian use can dry in 24 hours. Cleaning is also easy with just soap and water. Make sure to use appropriate clothing and safety equipment during application to avoid contact with the eyes and skin. Consumers throughout the country are satisfied with Ghostshield Countertop Sealer 770. It does exactly the job that it promises, and users also love its versatility because it can be used in various concrete surfaces both inside and outside your home. Some users have noted that it doesn’t hold up as well when exposed to acidic substances such as lemonade. All you need to do is make sure that you use protective barriers between acidic liquids and the concrete sealer to prevent any discolorations. The Ghostshield Countertop Sealer 770 is available on Amazon at a great price and free shipping. Order today, and this excellent sealer will be on your doorstep in a few days. With its food-safe ingredients, top-notch penetrative nature, and world-class sealing protection, there’s nothing more you could want from this amazing concrete sealer. Ghostshield Countertop Sealer 770 isn’t only affordable, but it’s the only product all your concrete surfaces at home will ever need.